Over the past five years, the waterfront has become an eating and drinking destination with over five beer gardens and tons of restaurants. Check out some of the best bites and sips below. 1. Buffalo Bleu chick'n sandwich and banana whips at the new HipCityVeg location at Spruce Street Harbor Park Sustained by Univest. All vegan all the time. 2. Happy Hour on The Deck Philly at the Moshulu. Be sure to try one of the signature wine pops. 3. New this year at Blue Cross RiverRink Summerfest: fried Tastykakes and scrapple. Yeah, you heard that right. 4. All of the paninis from the Penn's Landing Waterfront Cafe, a Waterfront resident and employee favorite. 5. 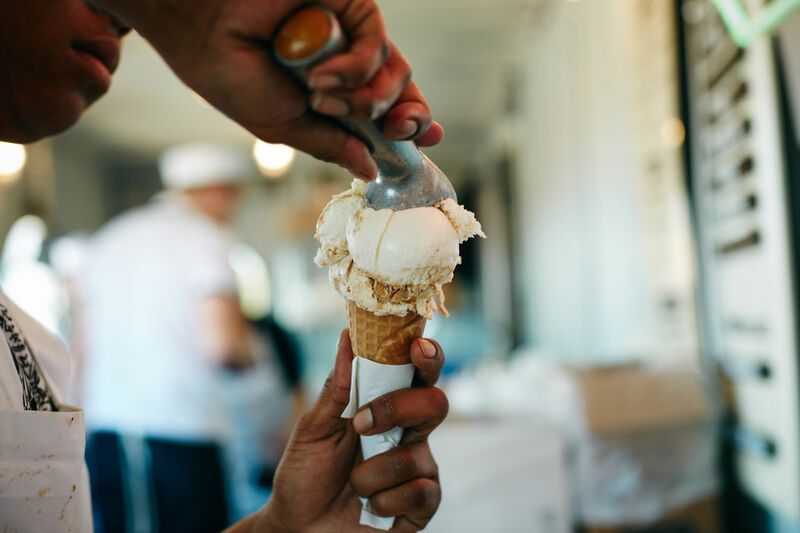 "The Sink," a build-your-own-sundae at the S.S. Franklin Fountain at Spruce Street Harbor Park Sustained by Univest or any of the real fruit fancy ices at the Franklin Sugar Shack (black cherry is to die for). 6. Lunch at Keating's Rope & Anchor. A hidden gem on the Waterfront and perfect for families or for lunch meetings. Side note: great live music at their outdoor bar. 7. Due to public demand, frozen strawberry daiquiris and margaritas are now available at Spruce Street Harbor Park Sustained by Univest. Get yours at the barge bar for the perfect summer evening of drinks, hammocks, and lights. 8. Kick back on summer nights while aboard the oldest steel warship afloat in the world. The Admiral's Tavern beer garden is popping up again on Cruiser Olympia at Independence Seaport Museum. 9. 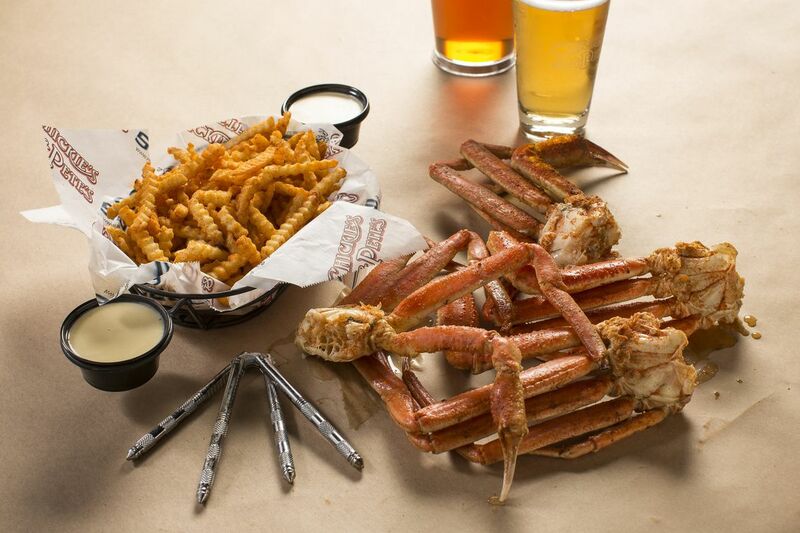 You've no doubt tried Chickie's and Pete's CrabFries. Now it's time to try their Sweet and Crabby Kettle Corn, started right here at the Waterfront. 10. Why settle for food on land when you can take a lunch or dinner cruise with some stunning skyline views on the Spirit of Philadelphia. 11. We've learned -- never turn down classic cotton candy from Frozen Delights. 12. Rumor is that the Pier Fries from Morgan's Pier are some of the greatest in town. Best washed down with one of their Watermelon Rickeys. 13. A must-try is the Sausage King – a bacon wrapped knackwurst with black truffle & foie gras from Froman’s Beer & Brats, the Impossible Burger at Village Burger, or the shrimp tacos from Distrito, all amazing Garces locations at Spruce Street Harbor Park Sustained by Univest. 14. One of the waterfront's newest beer gardens also has some of the best food and views. Check out the cajun crusted tuna at Fishtown Hops while enjoying their Wednesday - Sunday Happy Hour. 15. And last but definitely not least, the all-you-can-eat snow crab nights from Chickie's and Pete's at the Waterfront Crabshack at Blue Cross RiverRink Summerfest.